It used to be thought that respiratory diseases were transmitted primarily by droplet infection. You cough or sneeze and bacteria spray out of your mouth into the air and other people breathe them in; this is one possible method of infection but that it is not the only method. Touch is equally important, when you cough, being the well-brought up person that you are, you cover your mouth, trying to stop you from spraying your bacteria into the world and onto those around you. Where do the bacteria go? Onto your hand, of course. Then when you shake hands with a friend, the viruses are transferred to his hand; he touches his mouth and bingo, scores another victim for the nasty viruses. Bacteria and viruses differ in their ability to survive outside the body, some die in a few seconds; others can survive for long periods. There are bacteria and viruses everywhere, on clothing, on our skin and on all surfaces. Money, where do people keep this stuff, in their underwear? No wonder people launder money - it really needs it. People under-rate the dangers that on the surfaces that they touch all the time, furniture, desks, counters, hand rails and when they worry, they worry about the wrong ones. Work has been done recently looking at where bugs gather and which surfaces are the most disgusting. The location of the surface is obviously important, it should be no surprise that hospitals and doctor’ offices actually tested very badly, as did accountants and bankers. Lawyers’ offices were much less infested; even bacteria hate to visit a lawyer. The group of professionals most at risk was teachers; those coughing, sneezing spluttering kids can really contaminate a place. There are a few surprises as to which surfaces are dangerous; door knobs and elevator buttons that have long been thought to be potent sources of infection were found to be surprisingly clean. It should not surprise us that the old hand-held telephones are just teeming with microbial life; perhaps another reason to use your mobile. In the home the bathroom has some obvious hazards not necessarily from the toilet; sinks are also full of bacteria, as are over-used towels. But guess what the researchers found to be the MOST disgusting place, where the highest concentration of nasties lived, where is the cesspit of infection in our everyday lives? Computer keyboards, particularly when they are shared, are the most germ ridden places in the home or office, a veritable Sunday brunch for bacteria. Here is a jolly little fact - there were more harmful bacteria and viruses on an average computer keyboard than on the average toilet seat. My first thought is that you should take your keyboard and plunge it into a cauldron of boiling water for five or ten minutes; that will definitely kill all the bugs. Unfortunately my IT guys just told me that that is not good for the electronics and is not a method recommended to clean keyboards; a more gentle technique should be used. Start by vacuuming the board, there are probably enough crumbs and pieces of food down there to make lunch and that is what the bacteria have been doing. It is also good to vacuum the outlet from which the hot air is evacuated. There are some commercial sprays that you can use to clean the keys; spray and wipe clean. Disinfectants can be applied with a brush or a cloth; they can clean up keyboards and prevent them from spreading diseases that will end human life on the planet. Ed’s Note: If you want to use a vacuum cleaner around your keyboard, make sure that the vacuum cleaner is a “static safe” vacuum cleaner. As usual your column continues to inform and amuse us Thailandaphiles by both the questions asked, and the answers that you supply. In the April 10th issue there was an interesting letter from ‘Getting Annoyed’ where he stated his friends were giving him a hard time and intimating he must be ‘Gay’ because he wasn’t getting involved with some female company. His comments about how his workmates are regularly ‘cleaned out’ by their latest girlfriend/mia noi, reminded me of a gay guy I knew years ago in London. Each time I saw this guy he was full of the tale of how some new ‘boyfriend’ had cleaned out his flat, after he had left them at home whilst he went out to work. I wonder if the ‘ladies of the 2nd category’ in Chiang Mai are as bad as their female counterparts? Strange how few times (if ever), that relationships between consenting males seems to require your wisdom. Not that I’m leaning that way, but it makes one wonder, don’t you think? With your queries and references as to the gay community, you weren’t Michelangelo’s David were you? Just joking, my Petal, don’t get your fig leaf in a twist. I believe that there is just as many broken hearts in all sections of the community; however, the heterosexual one is more prone to bemoaning its collective fate in public than the homosexual or women of the second category, who tend to be less demonstrative in the public gaze. Thank you for asking about the chocolate over Easter. Not even a Mars bar, let alone chocolate eggs! Next time, please don’t ask, but just send some instead. I asked my Thai girlfriend to marry me, but she said that she could not because her family did not agree. I found this amazing as the girl, a woman really, is 28 years old and surely old enough to make up her own mind. We have been dating for the last three months, and I thought everything was sweet with her parents. I have been married before and have grown up children, but she does not. Do you think it is because I am a foreigner? Or is there something else I am missing here? I had intended taking her back to my home country after we were married. I think there is lots that I am missing in this equation too. Where do her parents live? Which stratum of society? What are their occupations, including that of the daughter? Where in the family hierarchy does the daughter come? All these can have an enormous bearing on the response by the family, as well as the woman’s adherence to family traditions. You also have to remember that you are probably more than twice her age, and again, as you have realized, you are a foreigner. What would your response be to a daughter of yours who had a boyfriend twice her age, and a foreigner as well, who might take her away to a foreign country? You have not been dating very long either, Petal. You may think you know this woman after three months, but I doubt it. Understanding Thai society and Thai minds can be a very difficult process for foreigners. Finally, it could really just mean that she didn’t want to disappoint you, so used the usual excuse. Sounds like a lost cause. Better start looking somewhere else. What do you do about house guests that keep on arriving from the old country? I’ve had five sets this year and it looks like there are more coming for Xmas. If I had nothing else to do other than entertain old friends then it would be fine, but I have work I have to do as well. I don’t want to give old friends the cold shoulder, but I’m at my wits end, honestly! What should I do? This is a very common problem when you live in a place that other people save for 11 months to come and visit. It is also very normal for your old friends to want to see you, and possibly save some money by staying with you. You actually have the answer already when you called yourself “Guest house” Gertrude. I suggest that you run your home more on the guest house lines. Tell your friends that as you have other work to do, you will leave everything out for them for their breakfast and then you will meet them for dinner at 7 pm and do things together from there. I am sure your friends will appreciate that even though they are on holidays, you are not. They need time to themselves too and will be grateful for the chances to explore on their own. Have some brochures in their room with suggested tourist day trips and let them take it from there. They will be happy, you can do your work, and you can enjoy each others company at night. Just think about it, you can even get one of those nice wooden signs with “Gerties Guest House” carved into it. Having seen a dreadful movie about space travel the other evening, it reminded me of when the Americans successfully sent John Glenn up into space again at the ripe old age of 77 years. It also reminded me of the spectacular photographic images that the astronauts brought back with them, all those years ago. The cameras they took up into space were film cameras, much the same as we used to take on family picnics. The concept was to record what life was like for our early space travelers and in fact some of these images were artistically so good that the pictures became a photography exhibition that toured the world in 1984. Unfortunately, they left quite a few of these cameras on the moon’s surface - so if you’re looking for a cheap Hasselblad it’s there for the asking. The trip could be a little expensive however! Hell, if you’d thought about it you could have asked John Glenn to bring you one back. Would have been duty free too! Yes, the cameras they took to the moon were mainly Hasselblads - legendary cameras used by most professional photographers the world over. 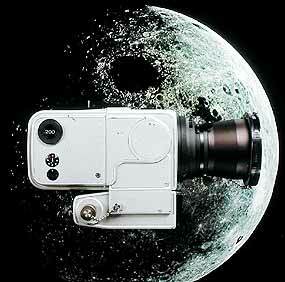 The moon cameras had titanium bodies as well! (Titanium is the second most expensive metal after Unobtanium.) In my pro studio days, I had two Hasselblad ELM’s and a 500 CM for back-up when I was heavily involved in commercial photography. And it was ELM’s the spacewalkers left behind. Weep! Those cameras are notable in the fact that the back is removable and holds the film inside it. You can shoot one roll and just clip on another back and keep on shooting. You can also rip off a shot on color print film and then take the same picture with a different back loaded with black and white and another with color slide, for example. The lenses are among some of the very best in the world. Great big chunks of optically perfect glass, which can cost well over 200,000 baht in some cases. Hasselblads are no “point and shoot” cameras, but very serious instruments to record life on earth (and in outer space) forever. Interestingly, professional photographers are not in the habit of running “automatic” cameras, and some of the Hasselblads are totally “manual” cameras. In this way you can set any of the parameters of shutter speed or aperture size independently. Another very different aspect of Hasselblad photography is the size of the negatives. Instead of the usual small rectangular 35 mm negatives that we have come to accept as “normal”, Hasselblads produce a square negative 6cm by 6cm. The advantage here is when making enlargements. You can blow up a 6 x 6 negative to the size of the side of a house before you lose sharpness. That’s more than you can do with even the best 35 mm ones! A lot of advertising agencies would only accept the larger negative format (usually on slide film) for commercial photography for that reason. But back to the moon. If you can ever get hold of one, try and grab a copy of the book called “Sightseeing A Space Panorama” with the ISBN number 0-394-54243-6. Published in 1985, it has 84 of the most stunning space photographs you will ever see. Shots of life in space for the astronauts, views of our world as the space shuttle passed many miles above us, views of the moon. All of them pin-sharp pictorial documents of our exploration of space. The final shots should, in my opinion, be made compulsory study for all of our children and our children’s children. They record the milestones we, as a species of life, passed on our way to hereafter. And what’s more they did it on Kodak film and Hasselblad cameras! A triumph for photography. There isn’t a day that goes by in which there isn’t another story on global warming and the devastating effect that it is going to bring upon the planet. Having read copious amounts of research on the subject, we no longer believe that these stories are scare tactics on behalf of “greenies” and in fact as the following paragraphs will attest, global warming is very real and something that is going to materially affect future generations. However, if you still remain sceptical after reading this commentary, remember that in as much as one insures one’s house against the possibility of fire or flood, even though the event risk is pretty low, not to do so would be equally risky. The same applies to those today who ignore the risk of global warming, for surely it is far better today to change our habits than to wait for younger generations who will end up paying a much higher price. Just in case the doom-merchants are right we should, literally, clean up our act now. It is with this in mind that the following has been written, for whilst the old cynic in me doubts some of the figures bandied around these days no-one can really deny that there is a problem. As Lincoln once said, “You may fool all the people some of the time, you can even some of the people all the time; but you can’t fool all the people all the time”. What is exactly is global warming? Global warming is a phenomenon that refers to the fact that the planet is overheating, not as a natural consequence of time, but as a result of humans’ actions. The Earth’s surface has undergone unprecedented warming over the last century, particularly over the last two decades. Astonishingly, every single year since 1992 is in the current list of the 20 warmest years on record. The graph below highlights the steady rise in temperatures that we have been witnessing over the last 20 years. What is the proof of global warming? 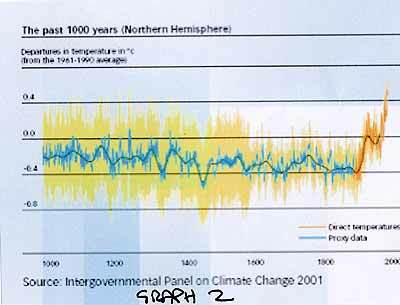 Many sceptics will argue that global warming is a natural event and one that has been happening since the dawn of time. 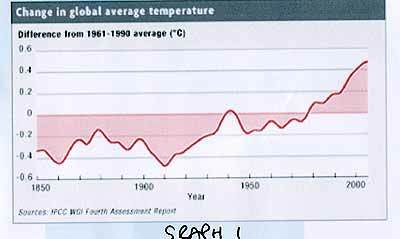 It is true that the planet has experienced extremes in temperature over its lifetime, with the period of the ice age being a good example. However, what makes weather patterns different today is that man is exacerbating these natural events and causing large shifts in temperatures to happen much quicker than before. The world’s oceans have absorbed about 20 times as much heat as the atmosphere over the past half-century, leading to higher temperatures not only in surface waters, but also in water 1,500 feet below the surface. The measured increases in water temperature lie well outside the bounds of natural climate variation. Measurements show that the average global temperature has risen by 1.4 degrees Fahrenheit in the last 100 years, with most of that happening in the last three decades. By comparing earth’s temperature over the last century with models comparing climate drivers, a study showed that, from 1950 to the present, most of the warming was caused by heat trapping emissions from human activities. In fact, heat-trapping emissions are driving the climate about three times more strongly now than they were in 1950. The spatial pattern of where this warming is occurring around the globe indicates human-induced causes. In its 2001 report, the Intergovernmental Panel on Climate Change (a group of more than a 1000 scientists from dozens of countries), had the following to say “There is new and stronger evidence that most of the warming observed over the last 50 years is attributable to human activities.” Carbon dioxide from fossil fuel burning and land clearing has been accumulating in the atmosphere where it acts like a blanket, keeping the earth warm and heating up the surface, ocean, and atmosphere. 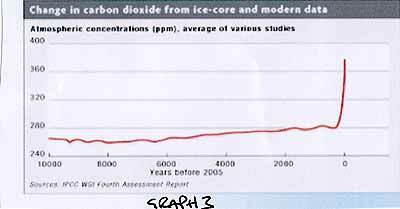 As a result, current levels of carbon dioxide in the atmosphere are higher than at any time during the last 650,000 years. The same report also noted that the Antarctic Peninsula has warmed five times more than the global average, with around 13,500 km2 of ice shelf lost over the past 50 years and 40% of this happening in the last decade. Many smaller Antarctic glaciers have undergone significant recent recession (shrinking); while there is evidence that some of the large ice shelves are now in recession too. At the time of the IPCC report, the major West Antarctic Ice sheet was thought to be stable for many years to come, but recent research has begun to question this assumption, and the likelihood of collapse now needs to be reassessed. Such a collapse could lead to rapid increases in sea level, of a scale up to seven metres if the sheet were to melt completely. Chinese medicinal halls in Singapore have made moves to cater to an increasing number of visitors interested in traditional medicine and treatments. Another medical hall in Chinatown, Mei Guo Ginseng, has also noticed this upward trend. Its supervisor, Ms Ivy Ngan, said: “There is good potential in the tourist market. In the past, tourists would walk in, look around and not buy anything. Mr Chan added: “Tourists, especially from Indonesia and even India, are willing to spend on expensive items such as cordyceps which costs about US$330 per 37.5g. This boosts immunity and improves the function of the lungs and kidneys. They also buy lingzhi spore capsules and go for top-grade ginseng costing about US$660 a box. The 127-year old Eu Yan Sang is one of the oldest traditional Chinese medicine (TCM) shops in Singapore. It also has a chain of clinics offering treatments based on TCM principles. The company has stepped up efforts to tap the tourist market and introduced traditional Chinese medicine to an international audience. Eu Yan Sang recently opened a shop in The Centrepoint’s new wing and has retail outlets in high-traffic tourist areas such as Tangs department store in Orchard Road and Changi Airport. Its historic flagship store at South Bridge Road and the centrally located The Paragon store in the heart of Singapore’s Orchard Road shopping belt are popular with tour groups. Mr. Chan said most of the tourists visiting his shops were part of group tours, which stop in Chinatown as part of the itinerary. However, he also receives regular tour groups of about 15 people organized by agents. These visitors, mostly from Taiwan or China, specifically want to buy Chinese medicinal herbs. “The Chinese buy herbs and medicinal products such as bird’s nest from Singapore as we offer a wider variety. They are also cheaper when compared to China and most importantly, they are confident they are not buying fakes,” Mr. Chan said. Relatively new markets such as the Russians, who are starting to travel to Singapore for medical treatments, are among those who visit traditional Chinese medicine shops. Uniglobal Holidays specializes in Russian inbound traffic to Singapore. Executive director, Mr. Eric Yap, said: “Traditional Chinese medicine is getting more popular with the Russians. They ask us to recommend places to buy herbal tea, medicated ointment and other such products. To cope with the growing interest in traditional Chinese medicine among overseas visitors, Eu Yan Sang said it had implemented measures to become more tourist-friendly. For example, there are English, Mandarin and Japanese language brochures and panels providing information on the medicinal herbs and products on sale. The sales staff has been trained to offer product knowledge and can speak English and Chinese. All traditional Chinese medicine halls in Singapore have staff that must complete a two-year training course at the Traditional Chinese Medicine College in Singapore. He plans to have a website ready in a few months so that overseas customers can place orders and find out about Chinese medicinal products. Eu Yan Sang is also trying to introduce traditional Chinese medicine to an international audience, such as those from non-Chinese communities, who may not be familiar with this approach to health and well-being. One way it attempts to do this is through its 68-seat restaurant called Taste, where food is prepared with medicinal products. For example, salmon is cooked with a Chinese herb xiakucao, which is believed to clear heat from the body. Then there is the seafood butternut dish that incorporates honeysuckle tonic and pearl powder. Even the chocolates here are made using ingredients such as red dates, said to replenish energy, and ginger, which prevents the accumulation of phlegm. Taste is part of Eu Yan Sang’s first-ever holistic healthcare store which opened this January. Called Red White and Pure, it is spread over 9,48m2 at Singapore’s largest shopping mall, VivoCity. The two-level shop also has a bar serving herbal tonic drinks, a wellness retreat offering acupuncture and other treatments, and a retail area selling cosmetic and skin care products made with organic ingredients. Guns, drugs, alcohol, four-letter words, rap music and violence: it’s all here in this adrenalin and testosterone laden film. Jim Luther Davis is an Iraq vet, a Ranger, who is having difficulty with adjusting to civilian life. We do not know what he was like before his military service, but we can only assume he is supposed to have been deeply damaged by the experience (the film opens dramatically enough with action seen through night-vision goggles) and is now suffering from acute Post Traumatic Stress Syndrome. Certainly, as he is played, with great brilliance, by Christian Bale [Batman Begins, The Prestige], who always gives an intense performance, Davis is a complete sociopath/psychopath. He dreams of becoming a police officer, but breaks the law all the time (though the police officer we do meet in the movie is seemingly as lawless as he). He has absolutely no control over his emotions and suffers ungovernable rages at the slightest provocation [caught by fractured camera images as his sanity slips and his bloodlust takes over]. He continually gets his friend [played by Mike Alonzo of Lady in the Water and Poseidon] into deep trouble through encouraging a dysfunctional life-style. Despite, or actually because of his instability, he is recruited by a Federal agency to work on drug suppression in Colombia. Celebrating this leads him into a downward spiral of violence, a killing spree and death. It is very hard to know what to make of all this. The director wrote Training Day and maybe the film is simply supposed to be an exciting cinematic ride. Certainly the pace and tension in the second half are genuine enough. But if this is really just an action film, it is a very grim one. It would be improved by some lighter moments or characters a viewer can care for. Could it be an exploration of the effects of war on men who have to kill for their country? If so, it seems one-sided. Such extreme reactions as this are surely not so common, and, as mentioned, without a little more of the history of Jim Luther Davis we cannot judge where the problem lies. Could it be a deep-felt attack on the US military and other uniformed groups? Definitely, the representatives of those groups we meet in the film are monstrous, but the movie does not feel satirical or political. In the first half the carefree ‘boys-will-be-boys’ lifestyle is almost glamorized rather than exposed as wrong. Probably the answer is that Dyer has not had a clear enough conception of what he wants. The topic proved too serious for his desire to give us the equivalent of a thrilling cinematic roller-coaster experience. He gestures towards important issues about soldiers who have seen action being suddenly returned to humdrum daily life, but has little to say about them. I felt rather assaulted by so much anger, bad language and attitude, but the film has pace, good camera work and committed acting. If Los Angeles, Mexico and the tough world of the streets sound promising to you, maybe Harsh Times will fill an evening for you. Call ahead to confirm as schedules are subject to change per managements discretion. Major Cineplex Airport Plaza, Telephone: 053 283-939, Movie times usually change daily. Vista – Kadsuankaew, 4th Floor Kadsuankaew, Telephone: 053 894-415, Times usually remain the same for entire week. Vista – 12 Huaykaew, Across from Kadsuankaew, Telephone: 053 404-374, Times usually remain the same for entire week. Warning: For at least the last showing of the day, the actual starting time of the movie itself may be up to 15 minutes ahead of the scheduled time. Spider Man 3: US Action/Adventure – This is scheduled to open today (May 1) and will probably saturate the available theater screens, with little else playing. This film is reportedly the most expensive ever made in US dollars, with a budget of $250 million. So that means it will be good, right? Generally favorable reviews: 68 out of 100. Pathfinder: US /Action – One of the Viking expeditions to reach North America hundreds of years before Columbus leaves as its only survivor a 10-year-old boy. The child is raised by Indians, who call him “Ghost,” either because of his pale skin or because they know the film will be haunted by clichés from a thousand other movies. Years later, the Norsemen return to exterminate all Indians and only the native-friendly Ghost can stop them. Dismemberments ensue. Rated R in the US for strong brutal violence throughout. Generally negative reviews: 28/36 out of 100. Blood and Chocolate: US Horror – Apparently even worse than the usual werewolf flick. Generally negative reviews: 33/37 out of 100. Meet the Robinsons: US Animated/Family – Disney. At Airport Plaza. Not an animal picture, but about a boy looking in the future for a family to belong to. A visually impressive children’s animated film marked by a story of considerable depth. Generally favorable reviews: 61/63 out of 100. Pleasure alert!! Shown just before this film is a genuine 1938 Walt Disney “Mickey Mouse” in the original screen size: “The Boat Builders,” with Mickey, Goofy, and Donald Duck. Hooray!! Alone (Fad): Thai Thriller – Very much worth seeing. Some genuinely creepy moments, and the story is fascinating, twisty, and well done. The Good Shepherd: US Drama/Suspense – At Vista only. Directed by Robert De Niro, who had been working on this film for ten years as his “pet project.” The fascinating subject is the birth of the CIA and the life journey of one of its founding operatives. The prevailing tone of the film is both cautionary and cynical in its very reasonable assumption that excessive secrecy can induce excessive paranoia among the operatives and their bosses. Slow and tough going, but fascinating history. The problem is the man was known to be emotionless and boring, however powerful; how can you make him interesting? With great difficulty, and not entirely successfully. Fine performances by an all-star cast. Rated R in the US, for some violence, sexuality, and language. Generally favorable reviews: 61/62 out of 100. Shooter: US Action/Drama – With Mark Wahlberg. An edgy thriller about a marksman framed as a Presidential assassin. Like the current The Good Shepherd, an angry warning against the government (any government): “Don’t trust them!” Mark Wahlberg is superb – a new action star. He did a lot of research and sniper training with experts to add believability to his character. For an action movie, terrific! I enjoyed it. Rated R in the US for strong graphic violence, some language. Mixed or average reviews: 53/56 out of 100. Me…Myself (Khor Hai Rak Jong Jaroen): Thai Drama/Romance – A man wakes up with amnesia and falls for a young woman without remembering his true identity as a gay cabaret singer. I found it of passing interest, but does an amnesiac also forget his sexual orientation? I don’t think so! That said Ananda Everingham as the amnesiac gives a fascinating and subtle performance. Quite an actor! The Haunted Drum (Perng Mang): Thai Drama/Thriller –Drummer uses haunted drum, causes many deaths. Looks very bloody indeed! The Number 23: US Mystery – Jim Carrey as a man obsessed with a book that appears to be based on his life but ends with a murder that has yet to happen. Rated R in the US for violence, disturbing images, sexuality, and language. Generally negative reviews: 24/35 out of 100. Confession of Pain: Hong Kong Crime/Drama – Tony Leung. From the makers of “Infernal Affairs.” Twisty crime thriller. Norbit: US Low Comedy – Raucous, sloppy comedy, primarily a showcase for the talents of Eddie Murphy as he plays three different characters. NY Times: “Murphy has always had the ability to turn broad caricature into something stranger and more inventive. He can burrow alarmingly deep even when playing broad, easy roles.” “Eddie Murphy gives it his all but Norbit is crass and unfunny.” Generally negative reviews: 27/33 out of 100.